Alcoy or Alcoi as it is officially known in Valencian, is located on the Costa Blanca, within the region of Valencia and the province of Alicante. With a population of over 60,000, it is one of the larger cities in this part of Spain. Alcoy is quite unique as it is the crossing point for five rivers. Alcoy is the capital of the L’Alcoia region. Alcoy is a large, spread out city, comprising of many areas. The historical centre is what draws most tourists, as well as the world famous fiesta for the Moors and Christians in April (see below). 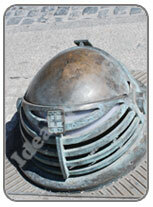 Pictured above is just one part of the wrought iron work that decorates the centre of Alcoy. The Moors and Christians banners are displayed a month in advance of the fiesta. A superb 18th century church in Valencian Baroque style. The blue dome can be seen from miles around and the church facade dominates the plaza in front. The tall tower has a small clock face and a bell tower. Pictured below right is one of the air conditioning outlets that can be seen in the main plaza. Of the 12th century, probably of Muslim origin, this castle has a rectangular keep and a superb courtyard. 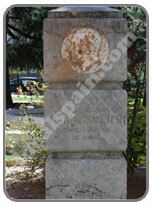 The castel was built as a refuge for Alcoy residents during the Castillian-Aragonese war. This watchtower dates from the 13th century. Alcoy is the crossing point of several rivers which is why you will find some excellent bridges in the city. The Canalejas Viaduct built in 1907 and standing 54 metres high. This viaduct crosses the River Molinar and joins the Viaduct Quarter with the Callosa d'En Sarria Road. El Puente de María Cristina, built in 1837 over the Riquer River. The Maria Cristina Bridge is of Medieval style with pointed arch supports. It rises to 27 metres. Built between 1925 and 1931, this stunning bridge rises to 42 metres over the River Riquer. The Museum de Fiestas is quite unique and should be visited. There's also an Archaeological Museum in Calle San Miguel. Built on the site of the vegetable gardens of the convent. Dating from 1836, the park has been remodelled several times. Alcoy has an excellent bus service within the town and a national bus service to major destinations. There are also good rail links. Alcoy has several taxi companies but the best way to get around is on foot, especially in the historic centre. The RENFE (rail) station is to be found in the Zona Norte. Alcoy is divided into barios (areas), including the centro, Ensanche, Santa Rosa, Zona Alta and Zona Norte. Arrival by road is via the N340 (Alicante-Valencia) that drops you in the Zona Norte. From here drive down the main street and the historic centre is on your left. There is a car park on the main road and two within the historic centre. 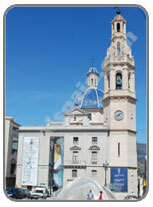 The tourist office of Alcoy is located in the historic centre, close to the main church. It's a small office but has English speaking staff. 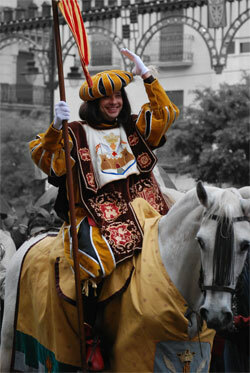 There is no doubt that the most famous fiesta in Alcoy is the Moors and Christians in April. Not only is this the biggest celebration of its kind on the Costa Blanca, but it's the biggest Moors and Christians fiesta in Spain. The fiesta is held each year between 21st-24th April and takes the town into a frenzy of colour and noise. St.George saved Alcoy when expelling the Moors by miraculously appearing on horseback. Now, each year, the town is decorated with the white flags of St.George. There are also thousands of green pennants, representing the Moors. On the first day there are two parades. The Christians parade in the morning and the Moors in the afternoon. On the second day, the religious part of the fiesta is marked with church services and a feast in honour of St. George. The 24th is the day of the big battle (Dia del Alardo). The Moors and Christians will battle in the streets with an inevitable win for the Christians, as it has been since the year 1276. The main battle takes place in España Square in a specially built castle. The Moors first take the castle then in the afternoon, the Christians take it back. The finale is when St.George appears and saves the day.